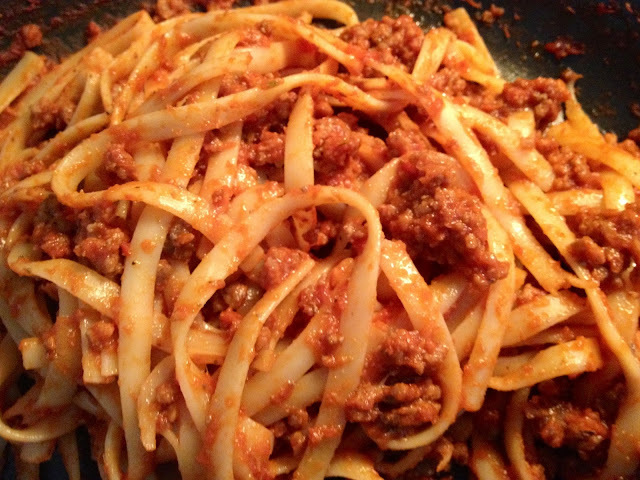 I consider this bolognese and not meat sauce. 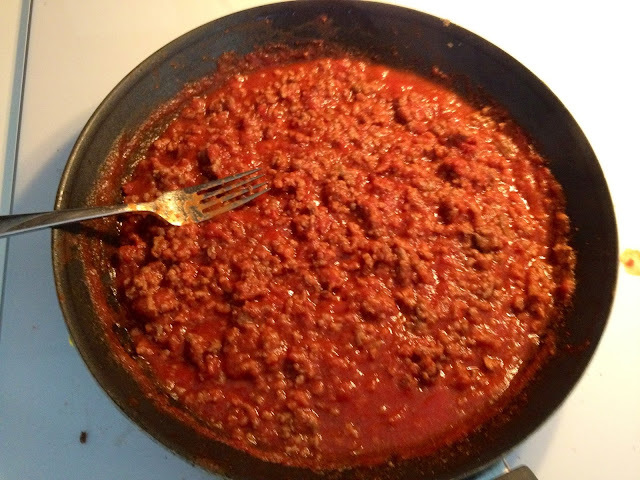 Generally a "meat sauce" resembles something with some meat texture. Anyone else feel they are ripped off in restaurants by paying for said "meat" and receiving a 1/8 of a burger's worth of ground beef? Ha. Enough with the rant. This recipe turned out soooo amazingly! Whip it up with some garlic bread, a salad and you have a party. 1. Brown beef with salt and pepper. Drain fat from meat. 2. Sprinkle a liberal amount of garlic powder, pinch of crunched up Italian seasoning and salt and pepper on meat. 3. Mix in can of tomato paste and 1 teaspoon of beef bouillon. 4. Stir in 2 cans of tomato sauce and let simmer. I like my sauce to be simmering before I even start to boil the water so that the flavors can condense. 5. Season water with salt and cook linguini to al dente texture. 6. Drain pasta and mix in sauce. 7. Sprinkle with parmesan and enjoy!! The best thing you can do with left overs is refrigerate obviously, but when you go to heat this dish up warm up your skillet. I don't know what it is about left over pasta warmed up in a skillet instead of the microwave, but it makes it 100% better. Anyone else ever try this technique? Hope you enjoy your pasta party.